Samantha and Chris were married on May 20th, with a ceremony and reception at Windsor Farm in Harwood, Maryland. We started out the day with Samantha and her bridesmaids in Historic Annapolis, while Chris and the groomsmen were prepping at Windsor Farm. These fun pre-ceremony photos of Samantha and her bridesmaids in their gorgeous dresses in downtown Annapolis were a great way to start the day. Samantha’s family farm, was the setting for both the ceremony and reception and it brought an incredibly personal touch to the wedding. 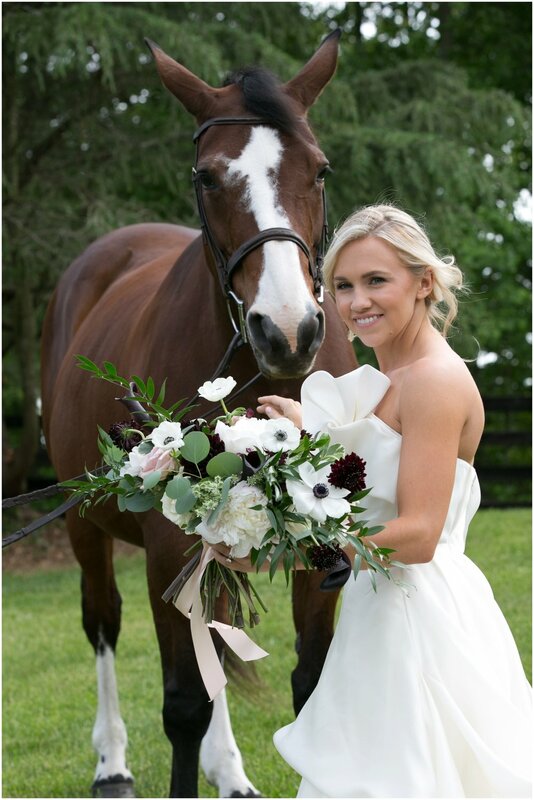 Their horse farm made created a stunning one-of-a-kind backdrop for all of their wedding day photos. Even the horses did their part to create some great photo opps! So, of course, it was the perfect place for a first look, which we set up in one of the pastures. It was obvious right from the start that the two of them have the most amazing connection—which of course, makes weddings so easy to shoot when we have such perfect subjects. In particular, we couldn’t get over Chris’s energy. He just seemed so excited, thrilled to be marrying Samantha, and that joy was constantly spilling over. to the bistro lights that hung from the tent. Charlotte Jarrett, the event planner, really helped these two to knock it out of the park when it came to providing the most romantic ambiance possible. Chris & Samantha, thank you for asking us to be part of your beautiful wedding. We loved spending the day in Annapolis and at your family farm with you and wish you the very best!